Experience a top hotel stay like those in Gangnam with Leciel Hotel. With its goal to provide a swanky, irresistible vibe that makes its guest feel like a Kpop celebrity Leciel will be able to give you that without a hefty price. With a wide variety of suites from 39 sq.m. rooms to their Presidential suites – you will think that you are in Gangnam with its one of a kind suites. In terms of service they also provide high quality room and customer service in every inquiry. Amenities at Leciel Hotel also will make you love it more with its own spa service and sauna that are similar to the Jjimjilbangs of Korea. For more information or you would like to inquire about their services make sure to check Leciel Hotel on Facebook. 3Q’s Sports Event Management is the leading AMATEUR / EXECUTIVE ROAD CYCLING event organizer in the Philippines. With 5 years of experience and expertise in organizing the biggest Road Cycling event that includes the famous “TOUR OF MATABUNGKAY”, “TOUR de NUVALI and “TOUR of PINES – VUELTA DAGUPAN”. 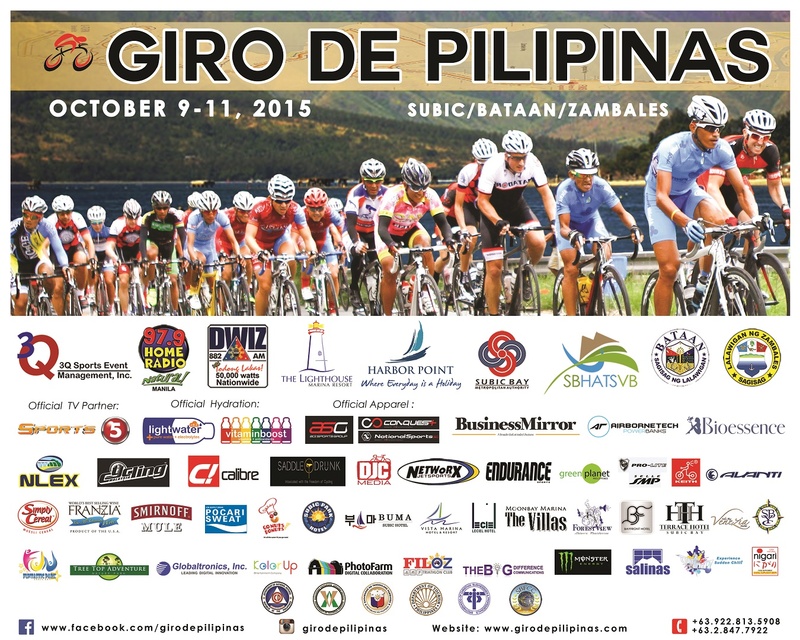 With that being said, Giro de Pilipinas (formerly known as Tour of Matabungkay) will be having a 3 day cycling event in Subic. 3Q Sports Event Management in Partnership with 97.9 Home Radio, Aliw Broadcasting Corporation and The LIGHTHOUSE MARINA RESORT supported by SUBIC BAY METROPOLITAN AUTHORITY (SBMA), Department of Tourism (DOT), SUBIC BAY FREEPORT CHAMBER of COMMERCE (SBFCC) and Subic Bay Hotels, Attractions, Tourism, Stakeholders & Visitors Board (SBHATSVB), Provincial Govt of Zambales and the Provincial Govt of Bataan proudly presents..
Giro de Pilipinas is a 3-stage cycling event that will be held on October 9-11, 2015 in which the route will include Subic, Zambales and Bataan. The highlight of the event will be the challenge of reaching the scenic view at the historical Mt. Samat, which every cyclist must be able to experience. The thrill and the challenge it brings will entice every cycling enthusiast. With an expected support of over 550 individuals and about 50 executive cycling teams nationwide and an overwhelming support from hundreds of participants all over the world including riders from Taiwan, Hong Kong, Singapore, Scotland, USA, China, New Zealand, Kenya, Germany, Korea, Dubai, Canada and Japan, this event will be something worthwhile and fun! GDP Event Objective is to support the growing community of cycling. To help in the promotion of Department of Tourism, specifically promoting SBMA, ZAMBALES and BATAAN not just a tourist getaway, but the next sports/ cycling capital of the Philippines, more so in Asia. To create a long term relationship with a brand (GDP) which promotes the true essence of sportsmanship, team pride, friendship, competition and the passion to towards cycling. To help promote Cycling in general as a tool towards healthy living and to encourage everyone to get out and form a team. The races are expected to be a high profile event in terms of media exposure, where various TV, radio and print representatives will be covering the event. Not to mention that this event is a prime venue to target executives, company decision-makers, business owners and high profile cyclists or cycling enthusiasts. 3Q SPORTS EVENTS MANAGEMENT INC. The team composed of equally passionate cyclist, Architect and Engineer by profession, The Baterna Brothers – Quin and Jojo ventures out to organizing sports event like cycling, duathlon, endure and running. Passionate athletes by heart, they continue to excel not just on races but they also create a name in the sports community. Quin is also a Diver, Runner, Biker, Golfer and been trying water sports while Jojo is into Triathlon, Enduro Bike, MTB, ATV, Jetski and speedboat competition. Another Partner, Rommel Bobiles has been doing Brand Activation, Events and Sports Marketing for the past 5 years and has been working side by side with the biggest Duathlon, Triathlon, Marathon and Running Organizers and Sports Brands in the Philippines. Together they formed 3Q Sports Events Management to help the struggling cycling community to bring back to its old glory. After attending numerous cycling event abroad including Tour of Friendship in Thailand they thought how they can help to promote the Philippines as another cycling destination in the Asia.